Hindu extremists keep Christians from medical care. NEW DELHI (Morning Star News) – Nearly two months after Hindu extremists in India humiliated, beat and forced Christians to praise a Hindu god, the host of the house church has yet to return to his home. Ranjeet Kumar Gautam is still in hiding after more than 20 Hindu extremists in Chapar village, Sultanpur District, Uttar Pradesh state on Feb. 7 burst into his home, beat the 39 adults of the fellowship, kept them from medical care and stood outside the police station threatening to kill them if they filed a complaint. House-church pastor Om Prakash said the hard-line Hindus kept the injured from getting medical are. The attackers went to the homes of the assaulted Christians, threatening further injuries if they obtained medical help or reported the attack to police, Pastor Prakash said. Fearing further violence, most Christians stayed home, and only five received medical help between midnight and 2 a.m., and one later during the day, he said. The brutality of the assault was so severe, the church members told Morning Star News, that they still tremble at the mention of it. Brandishing large wooden sticks, the assailants walked into the house at about 2 p.m. and began reviling and striking the Christians. Members of the Thakur community who are considered Kshatriyas, the second highest in the Hindu caste hierarchy, they spoke derogatorily of the Christians, Dalits considered below Hindu caste. Many of the assailants belonged to the Bajrang Dal, Hindu extremist youth wing of the World Hindu Council (VHP). Pastor Prakash said the hour-long attack included beatings that went on for more than half an hour. The 25 women present were also beaten, he said. The assailants said that they were there to kill Gautam, Pastor Prakash said, praising God for protecting the host from death. “They were not expecting so many of us there and so got busy beating all of us and could not focus on Gautam alone,” he said. The attackers repeatedly slapped and punched a blind woman, 35-year-old Gyanmati Nishad. Her face swollen, she had to be hospitalized, Gautam said. Mukesh Kumar, 26, a resident of Dadupur village 20 miles away, was beaten, kicked and thrown into a sewage opening twice, he said. Kumar was beaten so severely that the Hindu extremists broke two thick wooden sticks they were using, Gautam said. Flesh on his head was broken and his ear was torn, he said. “We tried hard convincing him to get immediate medical treatment, but he [initially] refused after the assaulters visited his house the same night and early next morning threating to kill him if he sought medical help or reported the matter to the police,” said Gautam. A worshipper who works as a journalist at a national newspaper fell unconscious during the severe assault. He too refused to get medical treatment and, fearing he would lose his job, he declined to disclose his name to Morning Star News. As Gautam’s 19-year-old daughter, Swasti, tried to rescue her father, the Hindu extremists slapped her face, beat her back with wooden sticks and kicked her many times in the stomach. Recently engaged to be married, she was left with internal injuries, he said. The assailants also broke musical instruments and furniture and tore up Bibles. “They snatched our bags, cell phones and collected all the Bibles – about 45 in number, and tore them apart,” said Pastor Prakash. 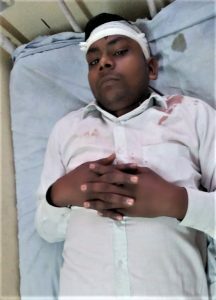 Targeted for planting churches in Chapar and nearby Tarahi and Shivgarh, Pastor Prakash sustained injuries to his head, hip, shoulder and ribs and still struggles to bend or work, he said. Since the attack, he has not been able to lead services at any of the fellowships. A Hindu friend of Pastor Prakash was present as he’d wanted to attend his first Christian worship service, and he phoned police as the assailants had seized the cell phones of the others. The attack came to an end only when police arrived, Pastor Prakash said. 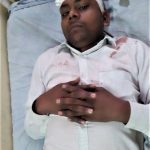 A pastor from a church in Pratapgarh, 38 miles away, later arrived and took injured Christians to the City Hospital in Sultanpur so that the Hindu extremists would not keep them from doctors or influence authorities, sources said. Under threat of being beaten again, the congregation has held no worship services since the attack. The congregation attained its size when Hindu extremists shut down two other churches in Chapar, and those Christians began meeting with the fellowship at Gautam’s home. Christians from another church in Gopinathpur village, three miles away, had also joined the Chapar house church after the same Hindu extremists three months prior had attacked it. When the Gopinathpur Christians filed a police complaint, the assailants registered a false counter complaint alleging that the house used for worship was sheltering terrorists, sources said. Though fearful, some of the Christians want to meet for worship again. Police have told the Christians to register the church if they want to worship again and warned them not to meet in homes, he said. With Gautam in hiding, his wife, Bindu, is struggling to make ends meet. She has sought tailoring jobs to sustain their six children, but villagers afraid of being assaulted have declined to give her any work, Gautam said. Dalits, or “Scheduled Castes” as the government official designates them, have been oppressed for centuries in the caste system. In spite of laws to protect them, the Dalits continue to face discrimination, harassment and violence. When police arrived they failed to act against the assailants, and officers have yet to register a First Information Report (FIR) on the attack, sources said. Police had promised to file an FIR based on the findings of the medical examination. Christians who approached officers in spite of threats on their lives for doing so are disappointed at police inaction. Police are under pressure as the assailants have close ties with influential political parties, Pastor Prakash said. “They have yet not registered an official complaint despite several visits to the police station,” he said. Moreover, the attackers have falsely charged Gautam’s family, Gautam said. Pastor P. David of Uttar Pradesh told Morning Star News that the ordeal is a black mark on a democratic country that espouses religious freedom. India is ranked 10th on Christian support organization Open Doors’ 2019 World Watch List of the countries where it is most difficult to be a Christian. The country was 31st in 2013, but its position has been worse each year since Narendra Modi of the Bharatiya Janata Party came to power in 2014.